How Much Does a Chick-Fil-A Franchise Cost? If you have $10,000, forget the burgers and put your money down on a license to operate a Chick-Fil-A restaurant. On top of the low franchise fee, there's no threshold for net worth or liquid assets. But get in line, and be prepared to toe the line. Your store will be closed on Sunday to give employees a day off to rest or worship, although you might have some discretion to allow work on Sundays when it comes to charitable activities. You will not be allowed to select your location or to open multiple locations. You will not own the property upon which the store is located, and you cannot sell it or pass it on to your heirs. If you want a business you can sell someday as part of an exit strategy, Chick-Fil-A is not for you. You will not own or receive any equity in your business. The franchisor will provide you with all your equipment, renting everything to you for 15 percent of your unit's sales. You will also have to surrender a whopping 50 percent of your monthly net profits (pre-tax) to the franchisor. In comparison, other franchise brands charge from 5 to 10 percent of gross sales. That's a huge difference that may not be worth it for you. It's not required that all operators be Christian, but in addition to closing the restaurant on Sundays, you must be willing to participate in group prayers during training and management meetings and publicly espouse Christian values. Franchise investment information is conspicuously missing from the company’s website as well as the internet, but good credit with a proven business track record might get you considered for a franchise. Founder Cathy Truett describes typical Chick-Fil-A operators as responsible "family men" with track records of solid decision-making, and says, "We're seeking people with character rather than experience." Should your initial application pass muster, Chick-Fil-A will interview you and your business partners as well as your family members and friends. If you're looking for a low-cost franchise and are low on cash, maybe Chick-Fil-A is the way to go. Though you might feel more like a Chick-Fil-A employee than a franchisee, you are probably only risking the $10,000 franchise fee. Perhaps because franchisees who make it through the selection gauntlet tend to be like-minded, the franchisee turnover rate initiated by franchisees is very low with a 5 percent turnover, and many remain franchisees for life. In today's climate of concern about joint-employer issues, some investors might be cautious about Chick-Fil-A, whose level of control over franchisees has been challenged by several states, alleging that Chick-Fil-A franchisees are actually employees. Thus far Chick-Fil-A has prevailed, though should this change in the future, the franchisor would become subject to occupational rules and federal employment discrimination laws that don't apply to independent contractors. 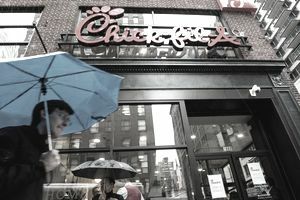 Chick-Fil-A has repeatedly been sued for employment discrimination, sometimes on religious grounds and sometimes based on gender in cases involving pregnant women. Although its expansion efforts have not always worked out Chick-Fil-A continues to enjoy strong growth in the southern U.S. and is now expanding to cities in the midwest and northeast. The franchise fee might be only $10,000, but to find out how much the total initial investment will cost you, you'll have to send in an application.